According to new research data from the Pew Internet & American Life Project, Teens share a wide range of information about themselves on social media sites. However, few teens embrace a fully public approach to social media. 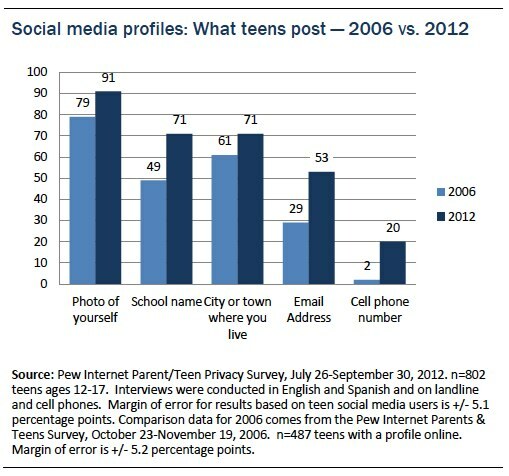 Teens share more information about themselves on social media sites than they did in the past. Teen Twitter use has grown significantly: 24 percent of online teens use Twitter, up from 16 percent in 2011. The median teen Facebook user has 300 friends, while the typical teen Twitter user has 79 followers. Teens have waning enthusiasm for Facebook, disliking the increasing adult presence and people sharing excessively, but they use it because participation is an important part of socializing. 60% of teen Facebook users keep their profiles private, and most report high levels of confidence in their ability to manage their settings. Teens take steps to shape their reputation, manage their networks, and mask information they don’t want others to know. Teen social media users do not express a high level of concern about third-party access to their data; just 9% say they are “very” concerned. In broad measures of online experience, teens are considerably more likely to report positive experiences than negative ones. For instance, 52% of online teens say they have had an experience online that made them feel good about themselves.